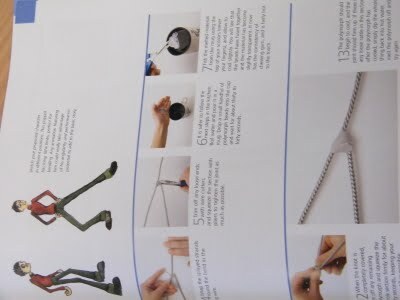 Before i made the armatures for the characters I looked at a book called to help me with making them correctly in previous animations i had made my characters were unable to walk properly so i thought it was important to look at this speicialist factor to ensure that my armatures where built correctly this time. more importantly my alice character ad really skinny legs and needed to be able to stand up so i found an example of how to make the armature for a skinny character so that it could stand and move correctly. 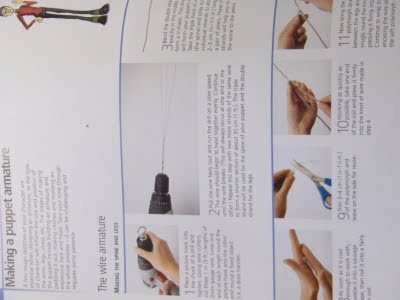 here is an example from the book that shows how to correctly make the armature with drill, i used the same method of placing the wire in the drill to twist it. 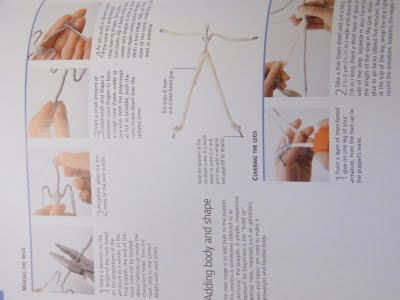 the book says to use 3 peices of wire together for added strength to the armature to prevent it from breaking and i only used 2 in my last animation i felt the armatue was week and parts of it broke off. I decided to follow the example from the book and use 3 peices of wire this time. i made a few alterations based on what equipment i had available and what was affordable to use for instance i used the glue gun to glue the wire together instead of polymorph. i found that before the glue dried completley i could press it around the wire so that when it dried it held it firmly in place. I shaped my wire into a similar shape to this using the same tools as in the book (pliers) to make a frame for the rest of the body. 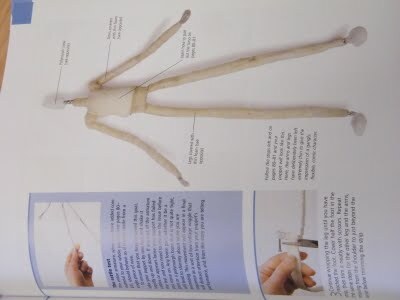 the book really helped to show me the specialist factors of creating an armature. I covered my own armature like the one above,i did niot use the same material because i had none available, I used tape but I followed the tehnique used in the research. it was important to cover the model so that I could add the moddelling material afterwards and adding the tape helped when it came to adding the other material to the armature. here is my covered armature, before i added the model magic i used model magic because it was light and wouldnt weigh the model down, the only part that needed to be heaveier was the feet so I put plasteine on the feet before covering with model magic this also helped the character maintain a grip when standing. here is the model complete before being painted, on top of the wire armature i have created using these references.